Whether you're a social media addict, a professional photographer, or just a regular iPhone user, chances are that you've looked for apps to edit your photos with. It is no doubt that the iPhone has a great camera, but sometimes you just want to add a little something extra to a photo or change the saturation a little. Then the following apps are some of the best photo editing apps available in the app store can greatly satisfy your needs. They far surpass the built-in editing functions in the iPhone camera, and will allow you to do just about anything you want to your photographs. 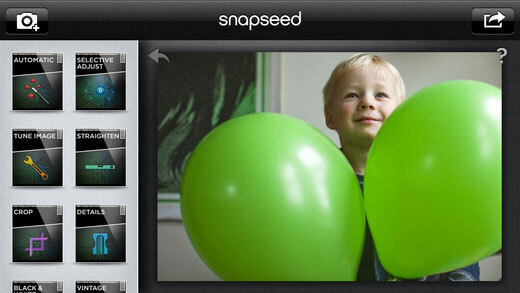 Snapseed just like a simpler version of Photoshop for your mobile device and allows the most flexibility for editing. Of course, this app has some filter options such as black and white, drama, grunge, and vintage. This app also allows the user to focus on the center and blur the picture around the edges, as well as use the "HDR Scape" to play with shadows and light. These features are just the beginning of this apps ability. It also gives the option to edit the entire picture by adjusting contrast, saturation, ambiance, brightness, shadows, and warmth. It also has a "selective adjust feature" which allows you to pinpoint the tiniest part of a photo and adjust only that portion of the photo. This gives a nearly unlimited amount of options when tweaking a photo. Finally, this app includes straitening, cropping, sharpening, and automatic functions. 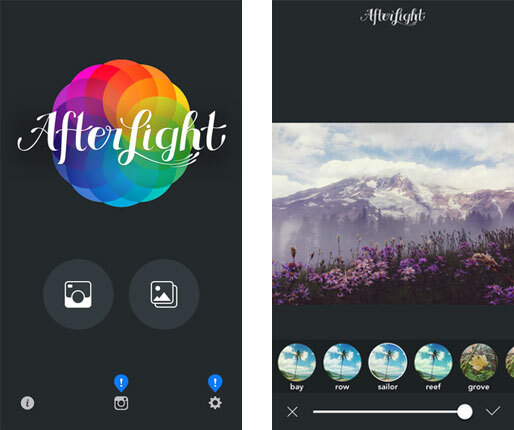 Afterlight, is a runner-up for this app. Although there's no selective adjustment, this app makes up for it with the amount of filters it has. The filter button opens up to five different categories of filters. Within each category, there are countless individual filters (probably one for every day of the year). After you've downloaded this app, you'll never bother with Instagram filters again. Saturation, exposure, sharpening, hue, temperature, brightening, and contrast are equally all part of the deal when it comes to Afterlight. In addition to these conventional adjustment options, this app has texture and light over-lays. This app is also great for Instagram because of its frame options. If you have a picture that's not a square and you don't want to crop it you can easily add a white border on the sides. You can also add white borders around pictures in the shape of a heart among countless others. Finally, Afterlight allows you to easily crop or flip a picture to its mirror image in addition to straightening. VSCO Cam gives the option to take the picture directly, or select a photo for editing from your camera roll. This app is for all the "hipsters" out there or anyone who particularly cares for the old film look. VSCO cam filters are guaranteed to make your photos look like film. The app also has options to add film grain to your photos, making them look even more authentic. In addition to these features, the app allows for exposure and color adjustments as well as cropping and the ability to play around with shadows. This app also has an image sharpening tool as well as options to adjust the overall tint, shadow tint, and highlight tint. 4 - Brushstroke is an app that defies all norms. Unlike other photo editing apps, this app does more than just edit. It actually transforms your photo into a work of art. As the name suggests, it turns your photo into a painting. While this app is not for the average Instagram user, it is quite fun for an avid painter or anyone who enjoys adding a little extra creative and artistic flare to their photo album. 5 - Photoshop Touch is another app that is very much like Adobe Photoshop. If you're looking for a basic app, this one is not suitable for you. It is part of the more complicated app with many options. If you love Photoshop and you're looking for something similar, this app is certainly right down your alley. It enables you to add layers just like Photoshop and gives the flexibility of blending and gradient tools. You can add text to your image, as well as warp it to absolute perfection. You're also given the ability to select pixels if you wish. The options do not end here. Users can also manipulate curves and levels and play with noise and temperature adjustment options. With the layer option, it's easy to blend pictures together and create something fantastic. 6 - Noir Photo is just the app for black and white photo lovers. If you're fond of color, look elsewhere. This app, as its name suggests, is strictly for black and white or monochrome photos. This app allows for the user to adjust lighting in a way that can illuminate or darken a subject. If you love vignettes, black and white, and dramatic light and shadow effects, this app is great to get on hand. After editing the photos with the above iPhone camera apps, you may like to backup them to your desktop computer, right? Then you can use the iPhone Photo Transfer to export photos from iPhone to PC or Mac, or you can copy all taken photos to computer and edit with the Photoshop on your personal PC as you like.